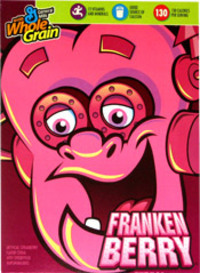 It’s the time for ghouls and witches, and other traditional characters now banned from schools, but my favorite bit of the Halloween season isn’t costumes or candy or parties, it’s – FRANKENBERRY! Thankfully, Target and other holiday-centric stores will snap up cartons of the Franken-goodness starting in early October. And so many of my friends know that I love it, they will pick up a box for me when they see it. So my day starts with a breakfast-of-champions, with 8 grams of whole grain, 13 vitamins and minerals (13, really? I love this cereal), and gee, let’s not look at the sugars. I’d invite you over for breakfast, but honestly, unless you bring your own pink box emblazoned with a happy cartoon Frankenstein, I’m not sharing.